Giovanni Nastasi – of Sicilian origins, he was previously General Manager at Belmond Grand Hotel Timeo in Taormina, and moved to Belmond Villa Sant’Andrea when Belmond purchased both properties in 2010. 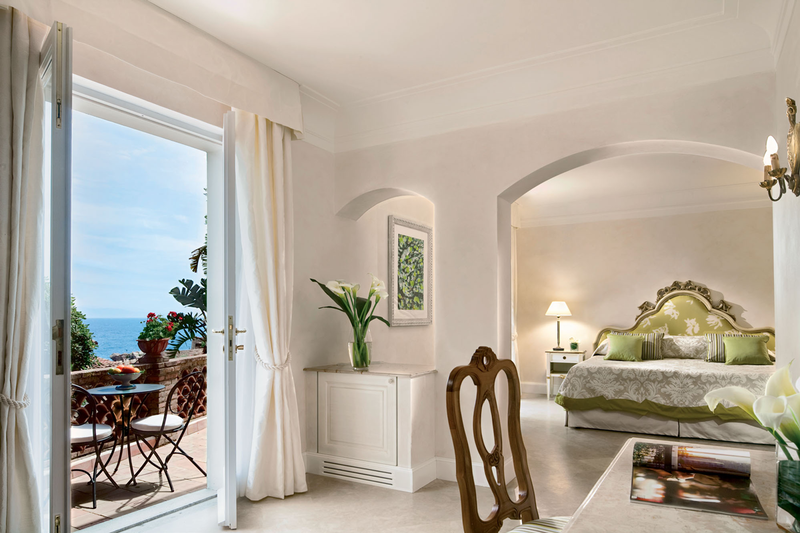 It is fitting that Belmond Villa Sant’Andrea began life in the 1950s as a hidden hideaway. 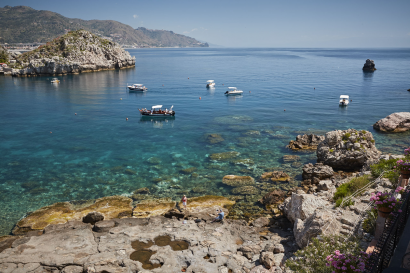 Perched on an idyllic stretch of Sicilian coast, this former villa oozes glamour and old-world charm. 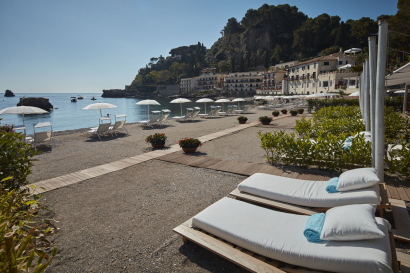 There’s something special in the air—relaxing in such magical surroundings gives new meaning to the phrase ‘la dolce vita’. A stay at Belmond Villa Sant’Andrea feels like reconnecting with long lost friends. We preserve the personality of an elegant private residence: you’ll be greeted with cool homemade lemonade when you arrive, and alfresco breakfasts offer a bounty of hand-picked local fruit. It’s these little details that will help you sink into a world of calm as soothing as the sound of the ocean. 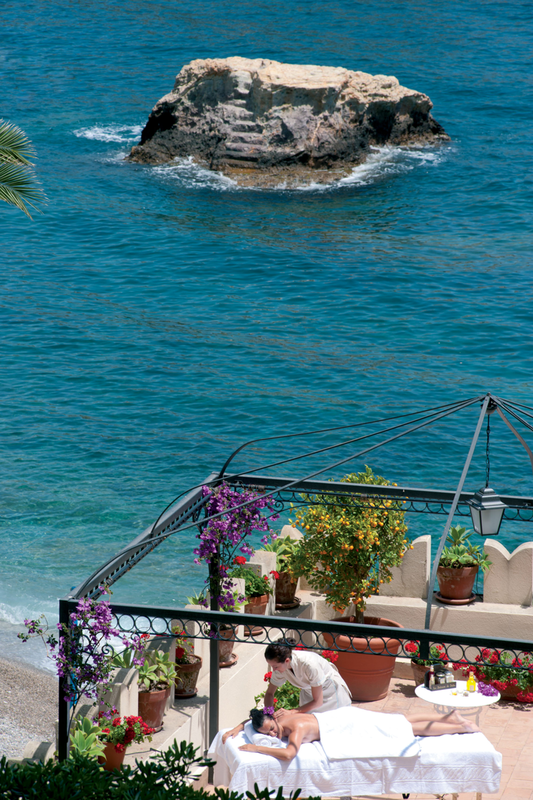 Balconies are bejeweled with bright geraniums, and lush terraced gardens lead down to our picturesque pebbled beach. Located on the Bay of Mazzarò, the hotel boasts a prime position in the heart of Taormina’s seaside district. 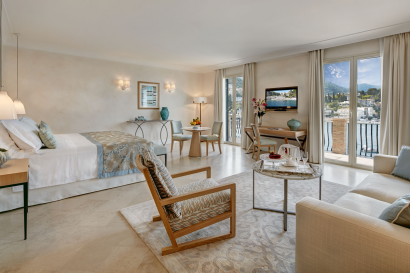 It is perfectly positioned between verdant, subtropical gardens and the dazzling Mediterranean Sea. 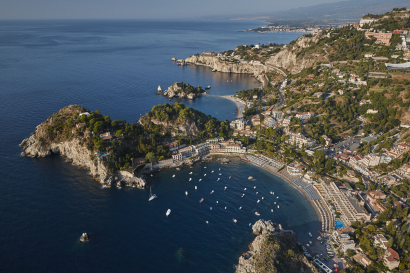 The shops, bars and cafes of central Taormina are only three minutes away by cable car. 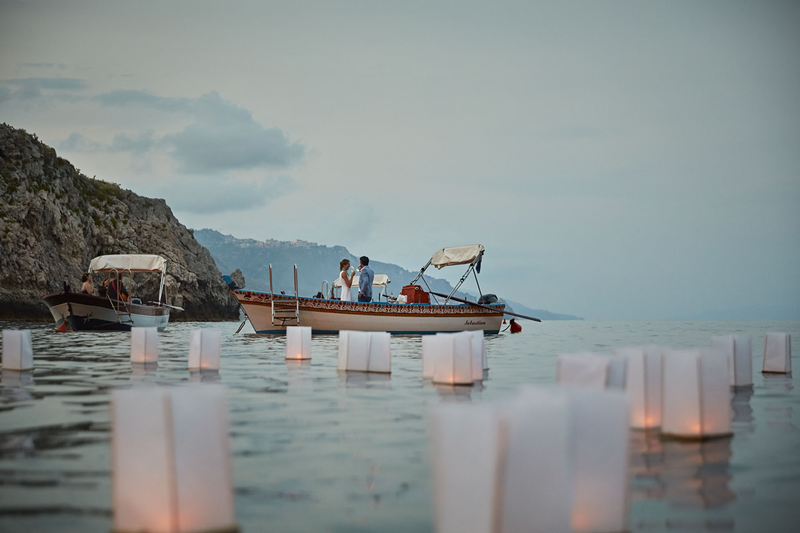 Every Sunday during summer the hotel’s beach is illuminated with candles and torches to create the perfect setting for an exclusive barbecue by the sea. Little ones will be entertained by our English-speaking tutor in the dedicated Smile Club, available from 4 to 12 years old in summer months. From sand castle contests and climbing to beach bag decorating, children will be captivated. 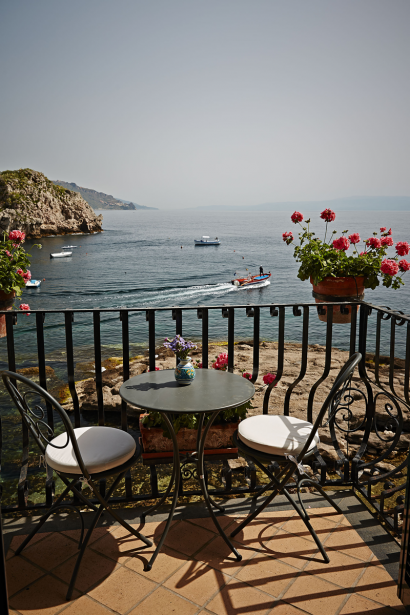 Savour the freshest Mediterranean and regional cuisine in a breathtaking setting facing the sea. 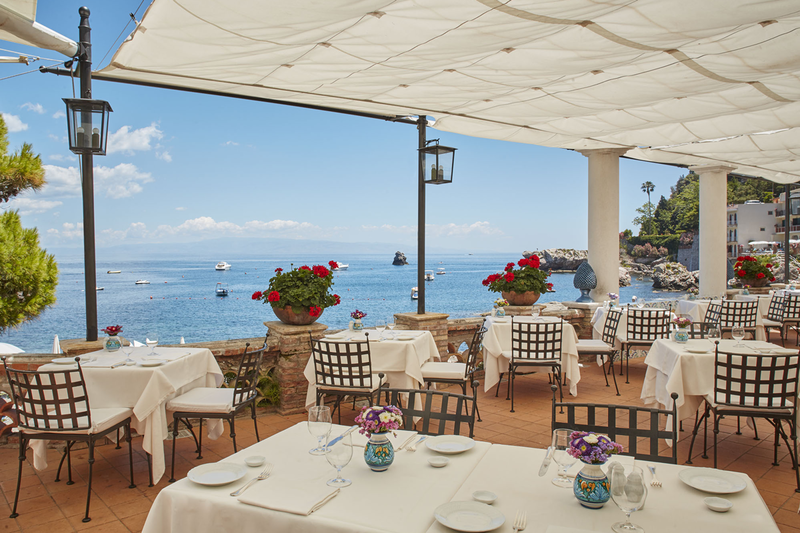 With a reputation of excellence among Taormina restaurants, Oliviero brings Italian classic cuisine to life with an innovative modern menu. 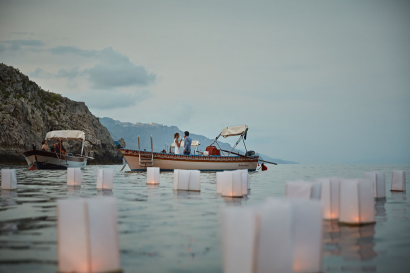 By nightfall, dine under the stars as the moonlight dances on the water. Delight in the freshest seafood straight from the bay. Try refreshing drinks, pizzas, snacks, and a variety of enticing light dishes. 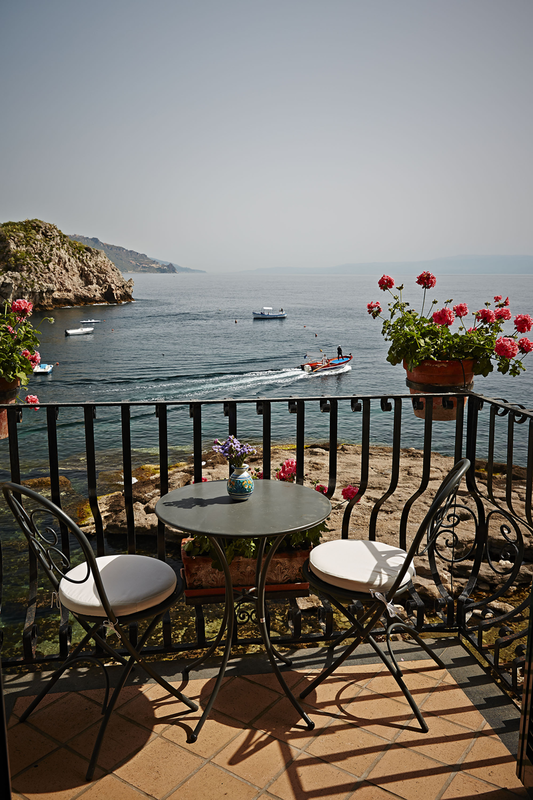 Come evening, watch the sun set over the water, aperitif in hand. Cocktails and live music light up the night. Pool Bar and Beach Bar offer refreshing drinks, delicious ice cream and juicy fruit. Our heated infinity swimming pool is spectacularly located by the edge of the bay. 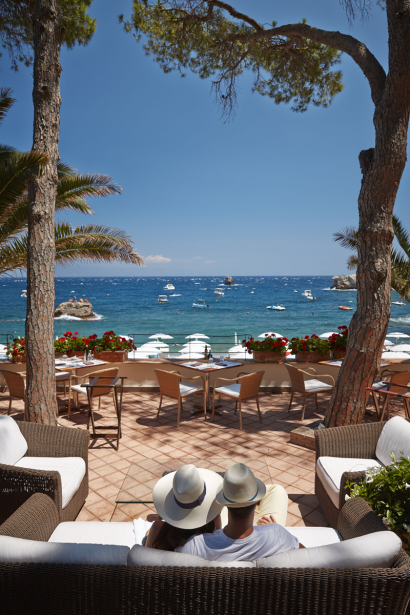 Let your troubles melt away beneath the warm Mediterranean sun as the dedicated poolside team meet your every need. The fitness centre is fully equipped with the latest technology, including Technogym equipment and free weights. The Wellness Centre perfectly captures the rejuvenating essence of this verdant island. 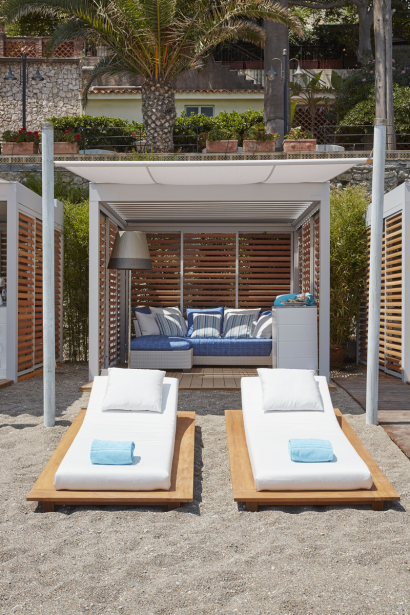 A heavenly range of spa treatments draws on fragrant orange flowers, amber, sandalwood and jasmine. Outdoor massages are available. 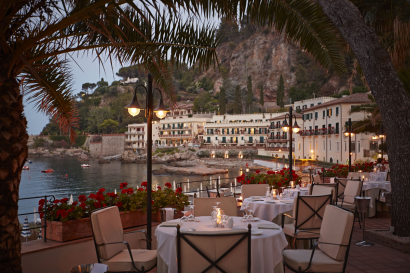 Belmond Villa Sant’Andrea boasts elegant venues to take full advantage of the coastal setting, offering beautiful sea views and menus featuring the freshest local delicacies. The hotel can host a private party for up to 200 guests on the expansive terrace overlooking the bay, arrange cocktails on the beach or, for more intimate gatherings, organize for a private table in the restaurant.